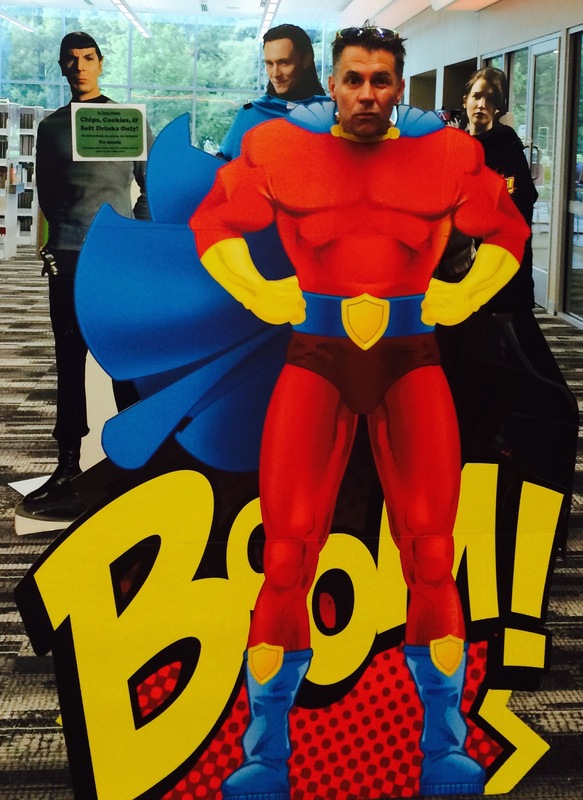 At the public library where Coe Booth did her public reading last night I had an opportunity to pretend to be someone that I’m not: Captain Boom! Unfortunately, in my uniform, all I could do is stand still and move my head (that was my superpower). In truth, I prefer to be Frog, the whacky, manic, creative, and optimistic writing-guy who loves to invest in teachers and youth to write up and beyond the limitations of school. That is a superpower that works for me. As per request, I created this space for each of you to find materials (presentations) from the four-day fiesta with the Writing Our Lives, Reading a World: The National Writing Project Meets Young Adult Literature workshop at the LSU Young Adult Literature Conference. This page gives you access to materials from our collaboration together as we’ve looked at YA texts to inspire a variety of written outcomes that go beyond standardized testing. Without further ado, here are links to the presentations you requested. I hope these materials/presentations will be valuable for you in the upcoming school year.